Some of you may know what it is, some may not and some have heard of it before but are not sure what it is. I’m talking about Cohort Analysis. 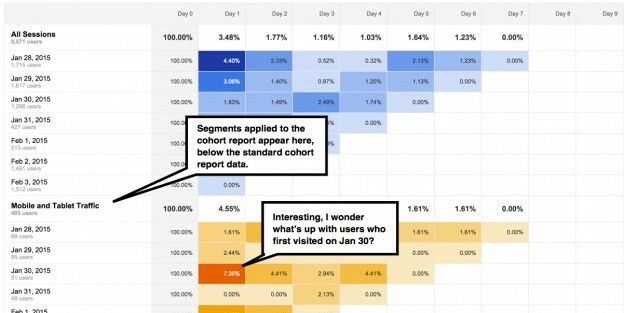 If you have been in the data analysis field for any period of time, you would know that cohort analysis is a very common data analysis method that entails you examine segments of users based on their sign on or acquisition date. A cohort means a subset of users based on a date. So you can use different variables as the start date. For example, a common type of cohort analysis used in ecommerce companies is to analyse the behaviour of customers that made a first purchase during a particular promotion. This gives them an idea of how well the promotion performed, above and beyond the first sale. Did the customers continue to purchase after the promotion or did they churn? How does their spend compare with others? 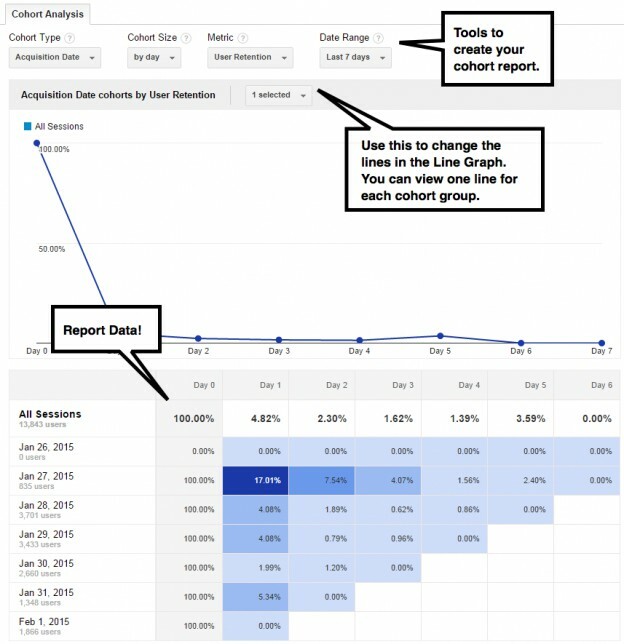 If you’re new to cohort analysis, then Google Analytics is a great place to get your feet wet. It wasn’t too long ago that they implemented cohort analysis reports. Cohort Analysis on Google Analytics is somewhat limited though in the sense that it can only measure a cohort based on the date of first session. That is the only Cohort Type they have at the moment, but we can still use that to learn more about cohort analysis. Based on the screenshot above, you can see that 17.01% of the visitors that were acquired on Jan 27 came back again the next day. However, on Day 2, only 7.54% of that cohort came back. The 17.01% of people that came back on Day 1 from the Jan 27 cohort is much more than the other days. Why is that the case? Now this is where you get the chance to do a deep dive on your marketing activities to find out what was working for them. One of the good things about Google Analytics’ cohort analysis is that you can still segment the cohorts by certain variables. In the screenshot above, you can see that the previous cohort was segmented even further by the types of devices that they use to visit the site. Mobile and tablet traffic was especially high that day, accounting for most of the spike in traffic. How you are going to use cohort analysis will depend on various factors. One of those is the type of website you are running or industry your are in. If you are in ecommerce, you would want a better understanding of which sales drove traffic and sales, and what happened after that. If a customer that bought a promotional item on Day 1, did they return to buy anything else within a given time period? Or did they churn? If you are a publisher, you want to better understand engagement over time such as how long visitors spent on your website or the bounce rate. This way, you can plan and create much more engaging content for your visitors.